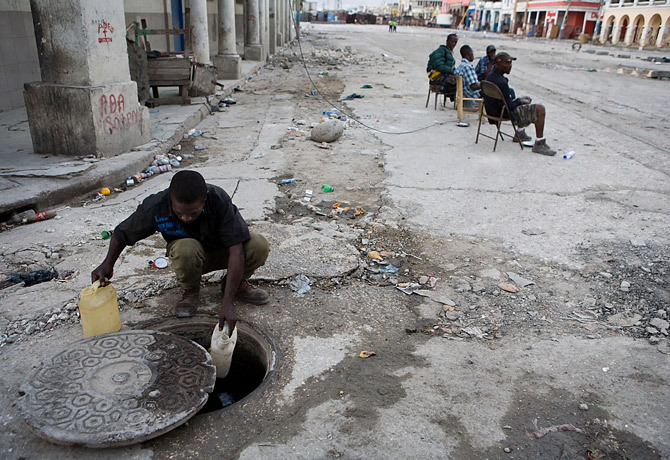 A man collects water from a manhole in downtown Port-au-Prince on Saturday, January 16, 2010. The grisly injuries, food scarcity and lack of shelter are agony enough for Haitians in the wake of last week's devastating earthquake. But even those travails may not be as dire as the potentially deadly dehydration that millions of quake victims are suffering, especially in the capital, Port-au-Prince. With the city's waterworks incapacitated and the relief-supply effort only now getting sufficiently energized, ramping up water delivery could mean the difference between alleviating the misery and exacerbating it. The answer may lie in the Caribbean water that the 2 million residents of Port-au-Prince see every day but can't drink. Sitting off the coast of Haiti, the aircraft carrier U.S.S. Carl Vinson can make some 400,000 gallons of its own fresh water every day, and much of it will soon be going ashore. The nuclear-powered vessel, which had been heading to its new home port in San Diego when it was diverted to Haiti hours after the quake, has massive desalination capacity  purifying the same ocean saltwater it traverses  and the Vinson has a daily excess of 200,000 gallons "that we can give away," says Commander William McKinley, who oversees the desalination process. Aircraft carriers have been desalinating ocean water since World War II, and in recent decades they've been giving away their excess H2O more frequently during humanitarian emergencies. But the 2004 Indonesian tsunami, which killed more than 200,000 people and left much of the Indian Ocean coast a wasteland, tested desalinated-water-donation capabilities like never before. One of the lessons aircraft carriers learned then  and during the Hurricane Katrina calamity a year later  was that they needed a better delivery medium if they wanted to make a difference during catastrophes of that magnitude. As a result, early this week the Vinson will receive up to 100,000 special 2- and 5-gallon water "bladders," collapsible containers that will make the transportation of such enormous volumes of liquid more efficient. If the Vinson could actually move all of its 200,000 excess gallons to Haitian distribution points each day, it could as much as double the present amount of water aid, which relief agencies and military helicopter pilots alike say is being used up faster than they can deliver it. That in turn would allow donor governments and organizations to turn more of their efforts toward augmenting other critical necessities like food, medical supplies and, later on, long-term help like building materials. Desalination is essential for nuclear-powered vessels like the Vinson. Nuclear reactors heat the water that makes the steam that powers the ship  but that water has to be pure. Some ships use reverse-osmosis technology, which pumps the saltwater under extremely high pressure through cleansing membranes. The Vinson employs a process that can boil the ocean water at a lower temperature and separate the brine. The carrier has four such water distilleries that can each produce 100,000 gallons of fresh water a day for both steam power and the crew's daily needs. In recent years, water-scarce cities near seacoasts worldwide have begun duplicating the method. But right now, the city that needs it most gravely is Port-au-Prince, whose 2 million residents are surrounded by little more than rubble. An increased water flow could ease tensions in the Haitian capital, where there has been sporadic rioting over relief supplies that began to reach adequate levels only over the past weekend, more than three days after the quake. A new shipboard drill on the Vinson has in recent days involved timing how fast the crew can fill each of the new containers with desalinated water. The result: 36 seconds. This week the carrier will find out how many of those jugs can reach the Haitians each day, and how quickly. If the effort is successful, the new flow of water could outpace Haiti's flood of tears. See TIME's full Haiti coverage. See pictures of Haiti after the earthquake.